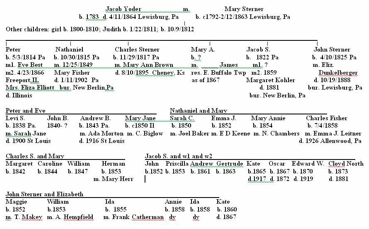 DNA IDENTIFIES JACOB YODER OF LEWISBURG, PA.
Jacob Yoder of Lewisburg, Pa. was born in 1783, married to Mary Sterner (c1792-2/12/1863), died Apr. 11, 1864 and was buried in the Lewisburg, Pa. Cemetery. He had a large family which included five sons who lived to adulthood. For many years we numbered him among our "unlinked" Yoder family members. By birth year, he matched a "missing" son of one of the Amish Yoders. The two oldest sons of Joseph Yoder (YR127) (c1757-1833) who married Elizabeth Jutzi are listed in his will, but it was not known what became of them. These sons were named George and Jacob. The YNL had tracked a George Yoder into Wayne County Ohio, and westward into Stephenson Co., Illinois. We reported new evidence in YNL 45 that confirmed that this George was the oldest son of Joseph Yoder. George and his descendants did not remain Amish. Peter, the oldest son of Jacob of Lewisburg, moved to Stephenson County. This led us to speculate that Jacob may have been George’s brother. Another hint that this may have been so was a "family tradition" in the family of Jacob’s middle son Charles Sterner Yoder that Jacob had been a "run-away Mennonite boy". Therefore, when we found our first volunteer in this family to join the Yoder DNA Project, we expected to see that the value for Y-DNA marker "19" would be "16" which is shared by the Amish Yoder lines. Instead, we had a surprise! This result was obviously not a match to the Amish line. It effectively ruled out Jacob of Lewisburg as having been George’s brother or YR127’s son. It also does not match to the ancestral Yoder profile. BUT it does match to one of the profiles which appear in the Oley Hans Yoder line! Two of the sons of Hans son of Hans the immigrant ("OH1") have different distinctive profiles, indicating they are not the natural son of OH1. 25th ANNIVERSARY OF THE YNL! 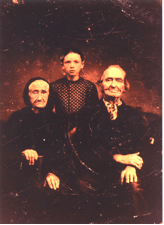 This mutation also appears in the descendants of the other 18th century Amish Yoder, Yost Yoder (YRB), meaning he was descended from a common ancestor as YR1 and YR2, likely their father or grandfather. Genealogical data shows several American immigrants who can be connected to Steffisburg family of the brothers Nicholas and Yost. In YNL 12 and 13, our Senior Editor Rachel Kreider speculated on which Steffisburg Joder male could have been the father of YR1 and YR2. We can now add to this analysis the results of the DNA testing. Joseph "Axie" Yoder (YR1212) lived and worked in Somerset County, Pa, and was a renowned maker of axes and tools. He was the subject of an article published in YNL10, Oct.
Chris Yoder, Editor, Saugatuck, MI; John W. Yoder, Circulation Manager, Middlebury, IN; Rachel Kreider, Senior Contributing Editor, Goshen, IN; Esther E. Yoder, Mail Manager, Goshen, IN; Donald Kauffman, YNL Webmaster, Edmonton, Alberta, Canada. Other Contributors: Richard H. Yoder, Bechtelsville, PA; Hubert A. Yoder, Charlotte, NC; Dr. Don Yoder, Devon, PA; Neal D. Wilfong, Cleveland, NC. YNL INCREASES PRICE ! After 25 years we have finally decided to increase the subscription price for the Yoder Newsletter from $3 per year to $5 per year. This price will be effective with renewals from now onward. Subscriptions already in effect will continue without adjustment. Inflation alone has more than doubled the cost during this period. No one connected with the Yoder Newsletter takes any salary for our efforts—it’s all done with volunteers. Your support as a subscriber helps us sustain the effort. Over the years, the YNL has also been able to make contributions to the House of Yoder, to print the Hardcopy edition of YNL 1-25, to support special mailings announcing the National Yoder Reunions, and to fund some of the Yoder DNA Tests. Please continue your support! CORRECTION: The cemetery mentioned on page 7 of YNL 49 is the "Pashan" Cemetery not "Payshan" Cemetery. The House of Yoder has copies available of the "Yoder Tourbook" which they prepared for the 2006 National Yoder Reunion. This excellent driving guide of the Somerset Co., Pa. area includes 143 pages of photos and data about Yoder sites. Price is $40.00 for the colored picture book and $25.00 for the black & white version, plus $3.00 shipping per book. Send check or money order to: The House of Yoder , P.O.Box 318, Grantsville, MD. 21536 . YODER SCHOLARSHIP ESTABLISHED: Virginia Theological Seminary announced The Ronnie A. Yoder Scholarship for students enrolled as Master in Divinity and Master in Theological Studies Degree candidates on Judge Yoder’s 70th birthday, July 10, 2007. Judge Yoder has been Chief Administrative Law Judge of the Department of Transportation since July 1, 2001. He has served as a Federal Administrative Law Judge for 31 years and sang professionally with the Washington Opera from 1985 -1996 and with local churches from 1991 to 2003.
restaurant on top of the mountain with a beautiful view of the Alps. 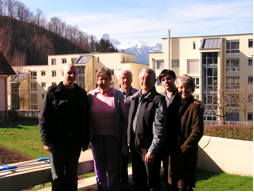 Carlon Yoder, Anna Joder, Hans Jakob Joder, Paul Yoder, Jared Diener, Marilyn Lehman, in steffisburg with alps in background. The following pictures of the Yoder crests were taken in the Reformed church in Steffisburg. They appear around the edge of the large "Moses Tablet" which decorates the sanctuary..
Dear Sir, -- Staff Sergt Donald A Yoder was killed in action on November 13th 1943. His aircraft, a B17, crashed near my home village in Northend, Warwickshire. My Mother, Aunties and Uncle all remember the crash. My cousin, Mark Hampson, went around the village and collected monies so that a plaque could be made and fixed to the war memorial. (Unfortunately it appears that Donald A Yoder has been misspelt as Donald A Yeder) . I have the crash report and it is spelt correctly on that and as well as his enlistment record he is listed as a recipient of the Purple Heart. I am doing some research into Donald A Yoder. I understand from his enlistment record that he was from Medina County in Ohio and he was a Mennonite Yoder. I would like to know where he was buried and if anyone has a photograph of him. It is my intention to produce something for the local church records and to this end would be grateful for any assistance that you could offer. - Yours Sincerely - Stephen Potts, Thatcham, Berkshire, England. Hi Chris -- We met with Robert Dale Yoder today, brother to Donald Yoder. It was a wonderful visit to meet a new cousin. A third cousin once removed on the Yoder's and also finding out that Robert's mother is related thru my Welday family. Robert has served in the navy 21 years, widower now and born in Feb. 1926. Robert gave us a picture of Donald (service uniform) and another of the whole group that are the ones that supposedly were in that fatal crash. He remembers the day that they received the letter and he was the one that open the letter for his father. It is still a heart wrenching pain of that days news. The paper quoted that Donald was only there in England three weeks before the accident. They were told that the plane had mechanic problems from icing. Got the photographs of Donald Yoder yesterday and they are just what I have been looking for over the past 5 months. Fantastic! I am planning to visit my mother, cousin and Aunty on Saturday and will try and get some eye witness reports on the B17 crash. I will also take some photographs of the field where Donald's plane crashed and will do a full write up on the story - this might take a few weeks, I would like to do it justice. Many thanks for your help and that of Esther Strock too - you have a family network to be really proud of ! Can't wait to show my family the photographs. The Rev. Robert Anderson Yoder (Con37c) (1853-1911) was a founder of Lenoir Rhyne College in Hickory, NC. He served as the first president of that institution from 1891 to 1901, and designed the Old Main Building (shown in the postcard photo above). According to family historian Fred Roy Yoder, it was Rev. 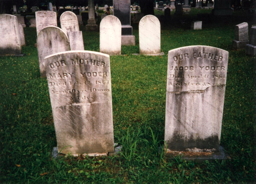 Yoder who first suggested that the Old Yoder Cemetery be cleaned and a monument be erected in memory of Conrad Yoder. The family followed through on this suggestion in 1958. We have dedicated the last remaining hardcopies of the bound and indexed Yoder Newsletter Issues 1 through 25 as a premium for donations of $100 or more to the DNA Fund. Chris Yoder will gladly inscribe these on request. Contact him at: cyoder@tds.net , phone 269-857-4327, or by mail at: 551 S. Maple St., Saugatuck, MI 49453. This home on Bridge Street in Catasauqua. 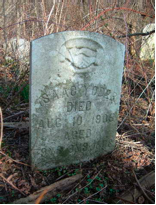 Lehigh Co., Pa. was the owned by Dr. Daniel A. Yoder (OY4371) ( 9/30/1833 Max. Twp.- 8/24/1920) who married Amanda E. Glace on 3/19/1861. A Glass plate photo of Daniel as a medical student was published in YNL17. We were contacted by the present owner, Deb Vannatta, as she researched the history of her property and thank her for the current photograph. The Jacob of Lewisburg descendant 12 marker profile is an exact match to the OH14- Peter Yoder line! OH141- Susanna who m. 11/3/1789 at the Schwartzenwald Reformed Church to Daniel Hoch (10/29/1755- 10/7/1835) She died before 9/8/1809 and was buried at the Zion Union Ch. She died between 1809 and 9/21/1819. OH144- Anna Maria b. 7/7/1773 m. at Schwartzenwald Reformed Church 6/21/1791 to Jacob Focht (Vogt) She d. 3/13/1863 and is buried at Huff's Union Church, Hereford Twp. Berks Co.
+OH145- John who m. Sep.1,1803 at the Schwartzenwald Church to Catharine Levan. He died after 1819. Peter’s will was made 9/8/1809 and probated 10/16/1809. The will gave 168 acres in Oley Township to son John, who was directed to give his brother Jacob the sum of $2,000. OH1462- Judith b. 1/22/1811 Whitehall Twp. OH1463- Elizabeth b. 10/9/1812 " "
This Jacob appears in the 1810 census for Whitehall Township (see below). We had looked at this census record many times over the years and what seemed to eliminate him as being our Jacob of Lewisburg was the 45+ age of the oldest couple in the family. It now seems that the older couple could have been Jacob’s or the wife’s parents. The 1800 Census record for Peter and his family supports that second son Jacob was born about 1784 or later. The DNA test results from descendants of Jacob Yoder of Lewisburg, through both son Nathaniel and son Charles, prove beyond doubt that this Yoder line sprang from Peter Yoder (OH14). Merging the information we previously had shows that Jacob Yoder was born in 1783 and he married Mary Sterner (c1792-2/12/1863). They were residents of Union Co., Pa. in the census from 1830 onward. Maria died in Lewisburg on 4/11/1864, and both are buried in the Lewisburg Cemetery. See the descendant chart on page 5. We can also now see that Jacob Yoder's father-in-law, Christopher Sterner, preceded Jacob and Maria in the move to what was then Northumberland County, in 1812. Sunbury Pa. Court House Deed Book R, p 135. "Christopher Sterner of Berks County Pa. Purchased 250 acres more or less on April 12, 1812 from estate of Adam Christ on West side of West Branch of Susquehanna River (then Northumberland Co.) For $4830." 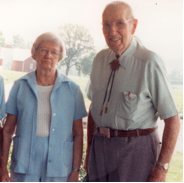 We’d like to recognize the late Walter and Mae Moore for their many years of research on this line and for their work in producing in 1994 a detailed family history and descendant record for the line of Jacob’s son Charles Fisher Yoder (1859-1926). -One sample from a descendant of the Catholic Joders of Hecken France does not match to the Swiss profile. -Two samples from Jacob of Lewisburg prove his Oley link (See the feature article in this issue). -Sample from George Yoder/Polly Bodenmeyer line supports his YR1271 (George s/o Joseph) Amish link. -YR14 line test establishes the 67 marker profile for YR1. -First test from YR16 line matches Amish profile. A coverlet that moved with Charles Sterner Yoder (1817-1895) from Pennsylvania to Kansas in 1884 is treasured by his great-grandson, Neil R. Yoder. At the time of this move, the coverlet was already 44 years old. Woven into the border are two blocks, signed Benj Angstad, Lewisburg, 1840. The coverlet may have been ordered by a previous generation and given to Charles and Mary Ann (Brown) Yoder, but they were its owners when it traveled west..
Charles and Mary Ann Yoder moved with their son Herman Brown Yoder, his wife Mary Alice Herr, their children, and two other families by renting a freight car to carry their combined household belongings to Sedgwick County, Kansas. Herman and Mary Alice Yoder inherited the coverlet, and when it was no longer used, it was saved as a precious piece of past Yoder history, noteworthy because of the signed blocks that told when and where it was made. Benjamin Angstad, the coverlet maker, and other weavers owned looms on which elaborate designs could be woven. They moved these looms from town to town. People could choose designs, colors, and decide whether the coverlet would be woven in one piece or in two pieces seamed in the middle. The Yoder coverlet is a beiderwand weave, woven in one piece, double-bordered, blue-on-white, and the design is relatively plain for Benjamin Angstad’s work, which could be more elaborate and colorful. Nevertheless, it’s a beauty. —Contributed by Betty Yoder, Bloomington, Ind. Four son of Joseph Yoder (YA24) and Katherine Roth. Joseph was the son of Christian Joder who died at Basel in 1852 and Barbara Schott. From the left: Daniel (1854-1924), Joseph J. 1855-1929), Eli (1857-1955), and Christian (1863-1950). –thanks to Lavon Yoder. First, who can we now RULE OUT? 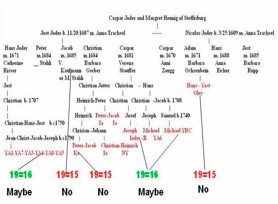 There are children of both Jost (Y6) and Nicolas who were linked in Steffisburg town records to the Anabaptists, but the links were more numerous on the Jost side. The only proven descent from the Nicolas side is from his son Adam, father of the Oley Yoder immigrants Hans and Yost. Adam is now proven to have a marker "19" value of "15". Even if he wasn’t already ruled out by the genealogical data, he is ruled out by the DNA information. 1)The "Amish mutation" began with Jost himself. 2)The mutation independently occurred with two of Jost’s sons (Caspar and Hans) simultaneously. 3)The mutation occurred with one or the other of these sons and the European attributions of lineage contains errors. We don’t know for certain which Jacob was Jost’s son, so we can dismiss the Jacob Joder - M. Stahli family results. However if the Christian Joder Barbara Gerber connection is correct, it would also seem to establish that Jost the father (identified by code "Y6") still had the "15" value. At the same time, the very low rate of mutation which occurs on the Y Chromosome makes it almost impossible for two brothers to independently experience the same mutation. Let’s look more deeply at the brothers Hans and Caspar. In this family, Y6b4 Hans and his wife Catherine Oesch, were the parents of Jakob Joder b. 1708 in Alsace, who was the father of YRC- Samuel , author of the letter to his Yoder "cousins" in America, which said: "My father was Jacob Yoder, a son of Hans Yoder who lived at Herffinen and Rosenthal and died at Dirmstein." And "If my older cousins are still living they will have known him..." Samuel is the ancestor of one of our "Amish Value" DNA testees. The son Christian (Y6b5) is of an age to have possibly been our 1742 immigrant Christian YR2. However, we know that Y6b5 lived in Salzwoogerhof-Gemeinde Lemberg/ Pirmasens, that he was the Amish Mennonite Bishop of the Fronschburg area, and that he had children born in Europe in turn had a son Christian who was born in 1732 in Salzwoog. This younger Christian married Maria Steinmann about 1760 (by that time YR2’s son Christain (aka "Schweitzer Christian") had been living in America for 18 years.) Christian, son of Y6b5, was an Amish-Mennonite preacher in Annweiler Tal and died in 1802. His son Joseph was born July 15, 1776 in Horbacherhof, and married Maria Katherina Germann. Their son Joseph, b. 1805 was the Joseph "Ioder" who m. Barbara Albrecht, came to Illinois in 1836, and is the ancestor of our second "DNA testee" under Caspar. In YNL11 Rachel Kreider write of this family "J. Virgil Miller has speculated that the father of our immigrants might have been Jost Joder Y613, a theory that has also appealed to Dr. H. F. Gingerich. Karl Joder stated that this Jost, who dropped out of his records, emigrated to America. Miller thinks it is more likely that this was the Jost of 1717 in Lachen and that his children would have been the emigrants. The Chorgerichtsmanual (Judicial Proceedings) of Canton Bern in 1691 noted that "the oldest son of Hans Joder of the Bernestrasse, named Jost, is never at home and the always reports 'Ersein jetz nit daheim sondernzu Kaserts in der Arbeit'." Miller says this being away at work was a typical excuse for hunted Anabapists. Miller points out that no other Jost can fit into this incident as well as Yost, the Amish minister who lived for a time at Lachen. The footnotes in AAMG discuss the possibility of Yost's coming to America (p. 573) but the probability that his sons came instead is just as great or greater and the dates fit well." The DNA test from this line came from a descendant of John (YA4) (b.1795 Steinbach, F- ) who m. 6/27/1822 Pfastatt, F Marie Marie Conrad (2/7/1799 Belfort,F- ). This John (Jean) was a son of Joseph Joder (1752-1825 Hirtzbach,F) and Marie Stucky, who was a believed son of Jean Joder (1714-1767) (FA13 above). This descent, if correct, would also seem to rule out Jost as the father of YR1 and YR2. It also seems to raise a question about whether he is the same fellow as the Jost at Lachen, in Germany. We do not know further details about Christian Y615, born in Steffisburg 4/9/1680. In YNL12, Rachel Kreider writes "The oldest son in both immigrant families was named Christian. There is no Jost in the first family and in the second one they got around to the name only by son number three. This could be quite coincidental, but remembering how the Amish so often used the paternal grandfather's name, we looked around for a Christian Yoder that could qualify and there is one. Yost Y613 had a brother Christian Y615, born in 1680. The dates do not fit as well; the fathers of the two generations would have had to be as young as 21 or 22 when their first child was born." LOOKING FOR DONALD L. YODER, VIETNAM VET: "Have been trying to locate all the men that served in the Army, stationed in Pleiku, Vietnam. DONALD L.YODER was one of the men. Our unit is Company B, 1st Battalion, 35th Infantry, 3rd Brigade, 25th Inf. Div. The time frame was 1965-1966. Donald should be around 60 years old. If anyone knows DONALD L. YODER, please pass my contact info on to him." Marshall Jackson, 803-286-0116.
Who were Moses Yoder (1824-1869) and Eliza ___ (1822-1906) who are buried at the Lewisburg, Pa. Cemetery? In the 1860 census, they appear in Kelly Township, Union Co., Pa. Send any info to Chris Yoder at the address above. 1987. In that issue we re-published an article about him from the Feb. 16, 1898 edition of the "Somerset Herald". "Axie" was born Dec. 11, 1788 in Somerset County to Jacob Yoder m Fanny Hochstetler , and married twice. His first wife was Gertrude Schrock who died in 1836. He next married Julianna Ramsberger, who was almost 38 years younger then he. "Axie" died Apr. 4, 1863 at Davidsville, PA and is buried in the Kauffman Graveyard. He is said to have been the founder of Summit Mills. Pa. Perry L. Yoder of Meyersdale, Pa. is a collector of tools made by Axie. Perry shared a display of this collection at one of the 2006 Yoder National Reunion tour bus stops. We can thank him for sharing this photo, which surfaced at a reunion of the Stevanus family (Axie’s second daughter married John Stevanus). The original is a tin-type and the identifications of Axie and Susannah were made by a granddaughter of Susannah (Yoder) Hoffman in whose family it was handed down. Susannah, b. 1846, was the first of nine children by the second marriage. She seems to be about 10 years old in the photo which would date it as about 1855. We don’t know who the older lady was. .... Milton J Gunder.. d.
THANKS FOR SUPPORTING THE YODER NEWSLETTER WITH YOUR SUBSCRIPTIONS! YODER PASSINGS-- Marcia Lee Zakarison (1/28/1957 – 3/5/ 2007) granddaughter of Fred Roy Yoder, author of History of Yoder Family in NC. She, her daughters, her mother & sisters went on the Europe Yoder tour conducted several years ago by Dr. Don Yoder . -- Mary L. Borntreger, age 91, died peacefully, March 17, 2007. She was the daughter of Emanuel Yoder (YR2612a61) and Lizzie Wengerd. She was given the name "Mother Mary" by some 50-plus children she fostered and babysat and was a member of the Kenton Mennonite Church, Kenton, Delaware. Several significant Yoder artifacts are preserved at the Mennonite Heritage Center in Belleville, Pennsylvania. The Jacob Yoder family Bible is there, as is Jacob Yoder’s coat. Jacob (YRB111) was born in Menno township, Mifflin County, Pennsylvania in 1812, the son of John and Mary (King) Yoder. His wife Anna was born on a nearby farm in 1815, the daughter of Christian (Kiefer) and Esther (Hertzler) Yoder (YR2514). Jacob and Anna likely began housekeeping at Jacob’s home farm. They later moved to Juniata County, then to Mahoning County, Ohio, and then to St. Joseph’s County, Michigan. Jacob died there in 1864. Anna later moved to Cass County, Missouri and died in 1887. Jacob’s siblings were Magdalena, John K. who became a nationally known Amish-Mennonite bishop at the Oak Grove congregation in Wayne County, Ohio, and Christian K. who was a minister in the Amish-Mennonite Church in West Liberty, Ohio. Anna’s siblings who raised their families in Mifflin County were: Lydia married to David Hertzler, Simeon H. married to Elizabeth Kanagy and later to Rebecca Stoltzfus, Daniel C. married to Elizabeth Byler and later to Barbara Glick, and Sarah married to Jacob Zook. Four others who moved away were: Elizabeth who married Stephen Kurtz and moved to Lawrence County, Pennsylvania, Christian who married Lydia Kurtz and moved to Oregon, Abraham who married Fannie Kurtz and moved to California, and Moses H. who married Barbara Kauffman and later Elizabeth Slabaugh and moved to Oklahoma. A coat worn by Jacob in the mid-1800’s has been handed down though the generations and is now preserved in a box at the Mennonite Heritage Center. The coat is handmade, with hooks and eyes, standup collar, and frock tail. The fabric is wool and cotton, possibly dyed with walnut hulls. In 2003 descendants and friends contributed toward restoration services, costing $790.97. The preservationist considers it an irreplaceable historical heirloom, and had it insured for $12,000 while it was in her care. For the additional restoration work required to have the coat for upright display on a form, with the other costumes displayed at the Heritage Center, the estimated cost is about $4100. Recently one Yoder relative contributed $1000, with a pledge of $1000 next year. So the challenge is to receive additional contributions toward the total cost. Anyone interested in preserving Yoder or Amish history is encouraged to contribute toward restoring this Yoder heirloom. P.O. Box 5603, Belleville, PA 17004. On Saturday, July 21, The Oley Yoder Heritage Association held its annual reunion. The Oley fire hall was the base for our gathering and they catered our Home-made Pennsylvania Dutch style luncheon. The day started with Nancy Yoder getting everyone registered, and with time for everyone to mingle and to check memorabilia that some family members brought to share. There were also displays of "Outhouse" related items, email responses from family members unable to attend, an announcement detailing the August North Caroline reunion, door prizes, and Yoder items for sale that everyone had a chance to check out. At eleven our president, Joe Yoder, called our gathering to order and introduced our first speaker, Henry F. Zerbe. Mr. Zerbe presented a delightful talk on "The Family Outhouse, An Endangered Species". His jokes, stories and descriptions had us all laughing, and had the older folks reliving some past times and some of the younger ones wondering about life in the past.